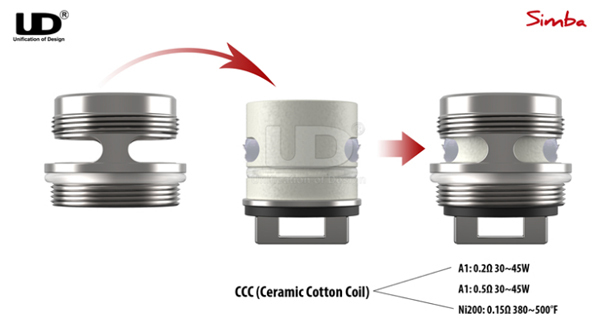 The latest offering to cross my desk from Youde (UD) Technology is the Simba Sub-Ohm Tank system with a ceramic coil, Stainless Steel coil and rebuildable base. For the past couple of months, every tank I’ve used seems to be either lacking in cloud production or have flavor so muted it’s almost tasteless but the Simba — in my mind at least — has the potential to stand out from the crowd for a couple of reasons. Over the next couple of minutes we’re going to pull this thing apart, break it down, see what it offers and how it performs, but I will tell you from the get-go, this little tank has impressed me so far. This tank was sent to me for the purpose of this review by my editor and as always, the opinions I offer are honest and my own. Measuring in at 48mm by 22 mm the Simba from UD is comparable in size to the Kanger SubTank Mini and many other atomizers. It’s a size and shape most vapers are familiar with so you definitely won’t hear many complaints about it being too big or too small. 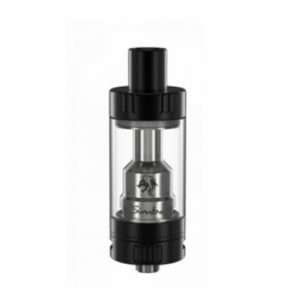 Available in Stainless Steel or matte black — I got the black one — it looks similar to other tanks on the market, in fact the only way this tank attempts to distinguish itself is with a logo motif and the word Simba on the chimney section inside the glass. The ‘not so standard” standard 510 drip-tip that comes in the kit seems to blend in perfectly with the tank and overall it feels as though UD were going for a complete understatement with this tank. It’s not big, it’s not flashy and unless you know what it’s capable of you may just pass it by in a display case. In a world full of showy tanks that fail to perform, this simplicity is a breath of fresh air. The Simba has a top-fill 4.5ml e-liquid reservoir with a shut off valve built in to the bottom, operated simply by twisting the top cap until the holes are either opened or closed. 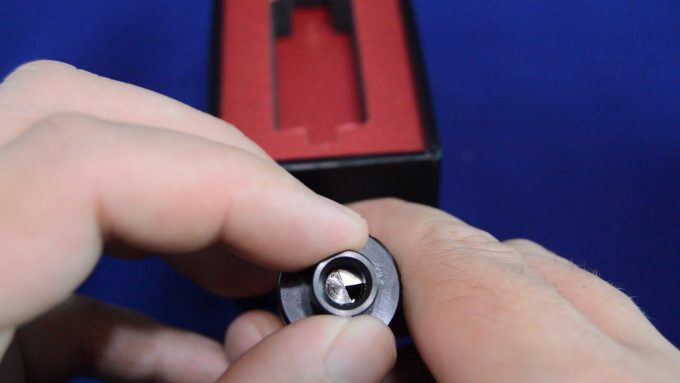 The 2 cyclops style slots, which are similar in size to the airflow control points, act as a juice flow control during operation and as a stop tap for filling the tank without any leaking issues. The top cap has knurling for easy grip and the threading on the cap makes for a simple filling experience via the massive e-liquid ports. The “not so standard” standard 510 drip-tip has an adjustable airflow control built into its core, by twisting the tip you can vary the amount of air coming through –we will touch on this in the performance section. The base of the unit features ample airflow control that can be adjusted to suit either low or mass volume vapers by twisting the insulated outer ring. The coil systems that are shipped with this tank immediately stand out from the crowd. The rebuildable base is designed for one coil which can be installed on either side of the deck while the other side can be blocked off with the rubber and ceramic stopper that is included. 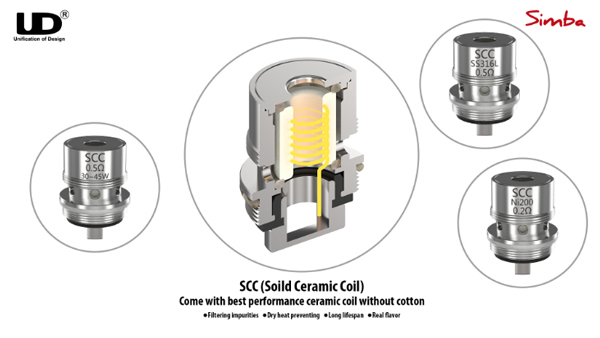 The massive dual coil system that they send out, while still containing cotton wicks, is surrounded by porous ceramic to reduce the heat transfer experienced by metal coils. The second coils contains no cotton at all and is a dual coil system completely encased in a ceramic shell for maximum flavor production without the worry of accidentally burning the cotton wicks. I have a single problem with the Simba’s performance and it is as simple as taking the adjustable airflow drip-tip off the top and launching it across the room. While the concept may have looked good on paper, from the get-go you are restricted to half of the volume coming through and can’t increase it any more due to the design. If you didn’t know that the airflow system was here –most of us don’t exactly read the instructions — you’d think that this tank had one hell of a tight draw. As soon as you replace the cap, this tank is a dream. The flavor from the full ceramic coil is insane, I used the Stainless Steel in Temperature control and wattage mode extensively and didn’t lose any of the flavor. Cloud production is solid for a tank and regardless of what other reviewers have said, when used correctly this tank is dream.